Amazon Price: $44.99 (as of April 18, 2019 10:23 pm – Details). Product prices and availability are accurate as of the date/time indicated and are subject to change. Any price and availability information displayed on the Amazon site at the time of purchase will apply to the purchase of this product. 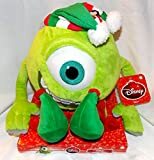 Plush Christmas Mike Doll from Disney's Monster Inc. He is approx. 11" high head to toe. Mike is dressed as a Christmas Elf.